Will Wilfried Zaha still be smiling after Crystal Palace's match with Brighton? Dan Fitch is expecting in-form Crystal Palace to inflict another away defeat upon struggling Brighton. "Brighton have only won twice on the road all season, with their last victory coming at rock bottom Huddersfield way back at the start of December." Crystal Palace returned to winning ways last weekend with an impressive victory at Burnley. The 3-1 victory was their fifth win in the last eight matches (D2 L1). If there has been a catalyst that has prompted this form, it was the loan signing of Michy Batshuayi in January, with the Belgian giving Palace a much needed extra option in attack. Batshuayi's presence has freed Wilfried Zaha from the responsibility of having to play as an out-and-out striker and he's revelled in the extra space that he's been afforded. 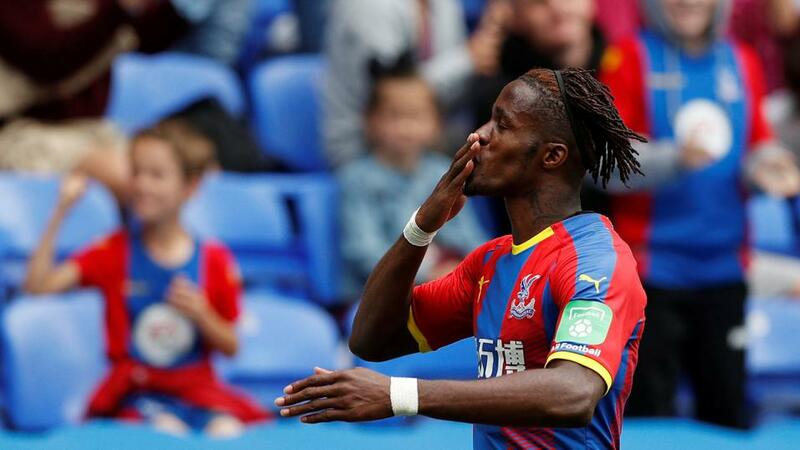 Outside of those from the top six clubs, Zaha is quite possibly the best player in the Premier League and unsurprisingly Palace are hugely benefitting from his return to form. Roy Hodgson is also profiting from the fact that his squad have a smaller than average number of injuries, at a time when fixtures are piling up for many teams. Mamadou Sakho, Pape Souare and Julian Speroni are the only doubts for the visit of Brighton. Like their rivals, Brighton also won last weekend, but there is less cause for optimism for Chris Hughton's team. The narrow 1-0 victory over Huddersfield earned Brighton a crucial three points, after a seven match run without a win in the Premier League (D2 L5). They are now five points clear of the relegation zone and a favourable set of home fixtures between now and the end of the season, should ensure that they retain their top flight status. Yet Brighton's away form remains a huge concern and is the obvious area for improvement if the club are to ever establish themselves in the Premier League. They've only won twice on the road all season, with their last victory coming at rock bottom Huddersfield way back at the start of December. Hughton at least has few injury worries as he looks to improve Brighton's away record. Leon Balogun and Pascal Gross are the only possible casualties for the trip to Selhurst Park. Crystal Palace are the [1.88] favourites, with the draw at [3.6] and a Brighton win at [5.1]. It's a decent price for a Palace side enjoying a run of wins, especially when you consider Brighton's away form. Brighton won the reverse fixture, but they are a very different team on their travels. Only four Premier League teams have scored less away goals than Brighton this season, with Palace available at [3.0] to win to nil. The over/under 2.5 goals market sees unders at favourite at [1.76], with overs at [2.26]. Palace's attacking renaissance could see over 2.5 goals land at what looks like an inflated price, with Brighton conceding plenty of goals on the road. The last three of Crystal Palace's matches have all seen three goals or more land with some ease, while Brighton's last four away games in the Premier League have done likewise. Zaha is the favourite to find the net at [3.0]. That looks like a big price for a player who has scored five goals in his last five Premier League appearances. Batshuayi is another option at [3.1], with the striker scoring his second goal for the club last weekend at Burnley. For Brighton, the former Crystal Palace forward Glenn Murray is out at [3.6] to score, having scored in each of the last three matches between the teams.